Monte Corona is at the center of a majestic mountain range, of which it is the crown (corona montium), and overlooks Umbertide (formerly Fratta) in the province of Perugia. 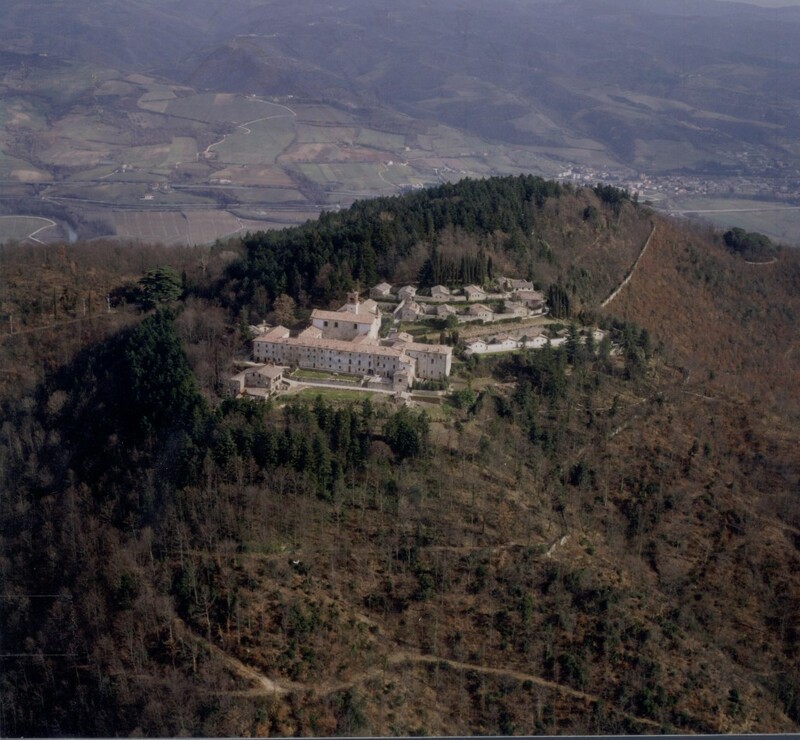 The Hermitage of Monte Corona was intended to be a kind of “new Camaldoli” for those who, although regarding themselves as being among the heirs of Saint Romuald, did not have possession of the “old Camaldoli” he founded in Arezzo. The parallels between the Perugian house and its archetype (of Arezzo) are many. The chapels of both were dedicated to the Most Holy Saviour. The Abbey of Monte Acuto, which lay below Monte Corona, was transformed into a hospice and administration center in imitation of Camaldoli’s Fontebuono. Both hospices operated a pharmacy of considerable importance. The new Camaldoli, like its precursor, was ample in size and was built to serve as the temporal and spiritual focal point of an expanding congregation. Little wonder, then, that artists sometimes have depicted Saint Romuald holding, not Camaldoli, but Monte Corona. The previous monastic history of the spot is worth outlining. The abbey of Monte Acuto’s eleventh century origin was attributed to Saint Romuald. In 1234 Pope Gregory IX gave it to the Cistercians. Two hundred years later, it was returned to the Camaldolese monks by Pope Eugene IV, but, since they never actually took possession, it passed into commendam. Thus it was received in 1506 by Cardinal Gabrielli, who in turn gave it to his nephew, Monsignor Galeazzo Gabrielli. In 1524, Galeazzo Gabrielli joined Blessed Paul’s Company of the Hermits of Saint Romuald, taking the name Peter (of Fano). The Company eventually secured his great wealth and his benefices, which included the Abbey of Monte Acuto. Since the new Hermitage was under construction at the beginning of 1532, the general chapter that met early that year was convened at the Grottoes of Massaccio. Peter of Fano (Galeazzo Gabrielli) was elected major, and since then the congregation has been called “of Monte Corona.” The monumental construction had been costly, and so Peter of Fano went to Rome in 1534 to seek papal financial assistance. There, in the heat of August, he died and was buried. For 330 years, the Hermitage of Monte Corona was to be the generalate of the order: seat of the general chapter and residence of the father major and father visitators. Over the two centuries to come, the Hermitage’s homonymous congregation would grow to a total of 550 members in 30 hermitages located in Italy, Poland, Austria, Hungary, Slovakia, and Lithuania. In the course of time, Monte Corona was suppressed repeatedly by anticlerical civil authorities. The seizure under Garibaldi and Carvour in 1861 proved definitive. Sold to numerous tenants, it finally became the home of a monastic community again, the Bethlehemites. The Brothers of that institute live there today. Below is a full size photo of the hermitage in Monte Corona.